During the workshop on April 11, Charlotte Malmborg, a natural resources technician with the New York State Hemlock Initiative at Cornell University (NYSHI), will provide information on the importance of hemlock trees in northeastern forests, the threat presented by HWA, and how landowners can identify and manage HWA infestations. She will also introduce New York State Hemlock Initiative’s research of biological control opportunities and describe the role of NYSHI in promoting hemlock conservation in New York State. DEC Forester Jason Denham will present on the invasive pests; emerald ash borer and the spotted lanternfly. He will provide an update on their status in New York, and how these invasive pests could be expected to impact the Adirondack Region. The workshop will begin at 5 pm. Participants will be outside for a short period at the beginning of the session to view hemlock trees and some of the common things found on them that may be confused for HWA. The DEC Region 5 Warrensburg Office is located at 232 Golf Course Road and is wheelchair accessible. The workshop is free but participants must register with Dan Carusone at (518) 668‐4881 or email at djc69@cornell.edu. Attendance is limited to 75 people, so register soon. 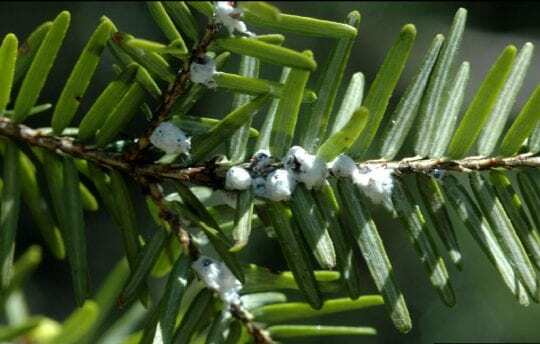 Photo of hemlock woolly adelgid courtesy DEC.